18-year-old Aileen Salas, a daughter of immigrants, holds a sign that says, "We are all immigrants," at the Families Belong Together march in Naples. 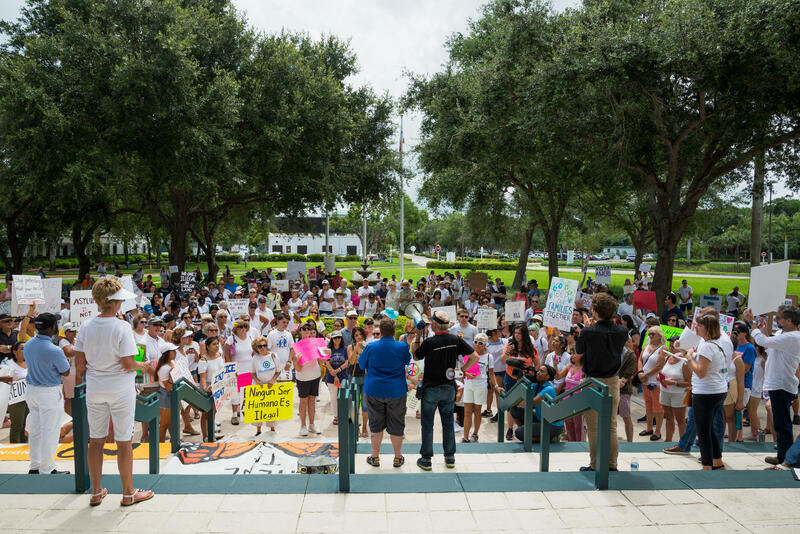 Tens of thousands across the country rallied Saturday for the reunification of immigrant families separated at the U.S.-Mexico border, and hundreds gathered at one march in Southwest Florida. Collier County, Florida, sticks out as a blood-red buoy in the otherwise purple sea of the swing state. But, the conservative majority in the City of Naples also shares the county with majority-minority areas, like Golden Gate and the unincorporated farmworker town of Immokalee. News of Immigration and Customs Enforcement arrests in both areas spread quickly across social media throughout the week, which is what inspired Golden Gate resident Josefina Almanza to rally. "On Monday morning, I saw a bunch of workers in the back of a truck. They were taken," Almanza said. "And, it was hard to see it, especially, like, having my dad be taken away from me when I was 8 years old." A crowd gathers in front of the Collier County Courthouse to listen to personally affected speakers before the start of the march. Almanza is originally from the Dominican Republic, as are her parents. She said her father was detained for a month at a facility across the state in Homestead, before being released. 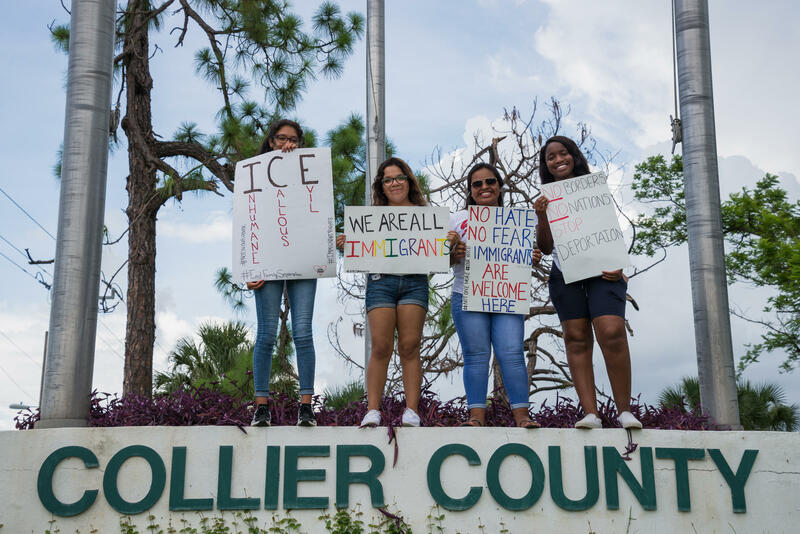 Now, the 19-year-old stood atop the Collier County sign beside friends, like Aileen Salas, who have also been affected by the Trump administration’s immigration crackdown. Josefina Almanza, Aileen Salas, Marilyn Diaz and Tanisha Raphael hoist handmade signs, protesting Immigration and Customs Enforcement and the Trump administration's immigration crackdown, atop the Collier County sign in Naples. "I’m 18," Salas said, "and to be living with this fear is a lot because I’m so young." Salas is originally from Miami, where her Puerto Rican mom met her Peruvian dad, but she said she liked growing up in Naples since. It was much calmer than the east coast, until now. "My mom is in fear for my dad, and my dad doesn’t show that he’s scared. But, I can tell that he’s scared, and I’m scared for him," Salas said. "Like, I call him every single moment, saying, 'Hey where are you at? Like, are you okay?'" Salas said she has spent a lot more time on social media recently, checking to see if anyone was posting about ICE in the area, so she could pass the warning on to her father. Salas and Almanza were flanked by more friends with personal ties to the movement. One has parents from Mexico, whose temporary work visas have run out and aren’t being approved for renewal, and another has a Haitian mother who will soon lose her temporary protected status. 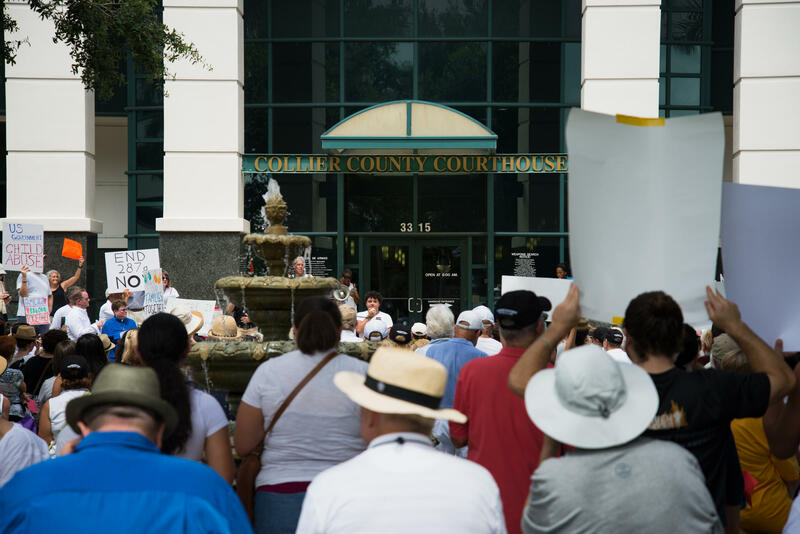 Hundreds gather outside of the Collier County Courthouse before the march in Naples. 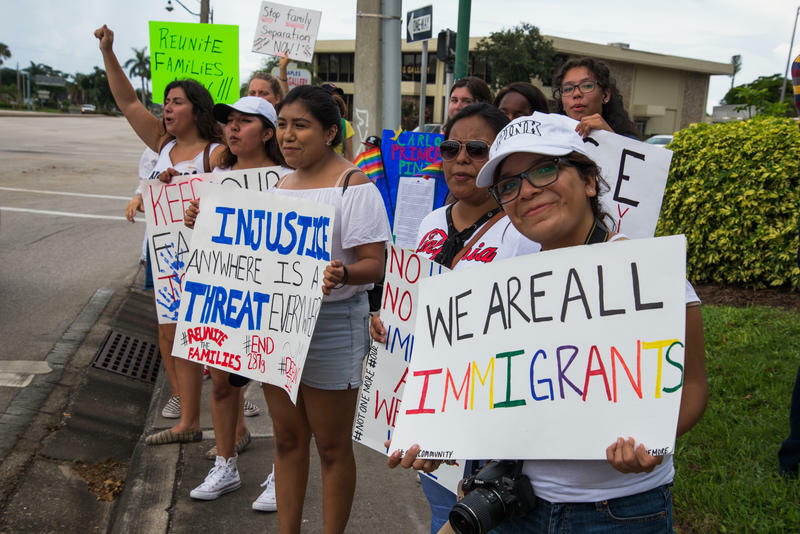 These daughters of immigrants – armed with handmade protest signs – joined hundreds of like-minded marchers on one of the busiest street corners in town, chanting “Un pueblo, unido, jamás será vencido," which translates to "A people, united, will never be defeated." Governments have existed historically to offer aid, security and order, and for just as long, churches have done the same. 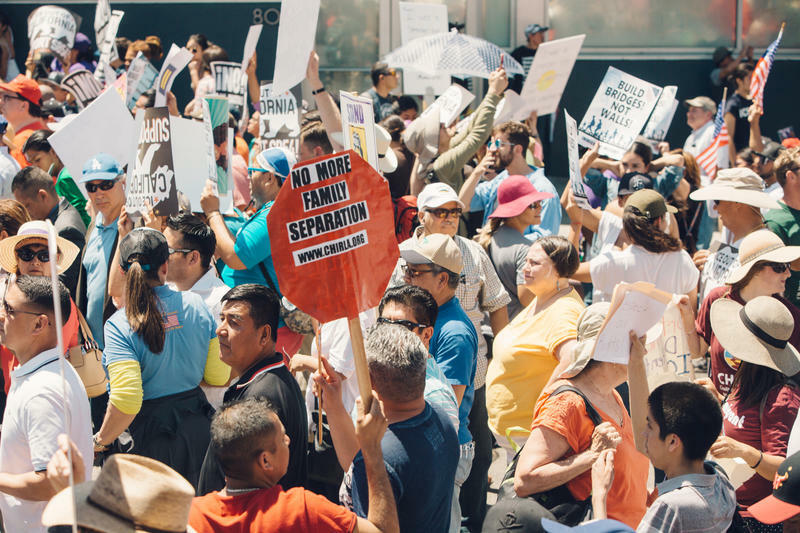 So, when the federal government could not answer people’s questions about separating families at the U.S.-Mexico border, people looked to the faith community to speak up. 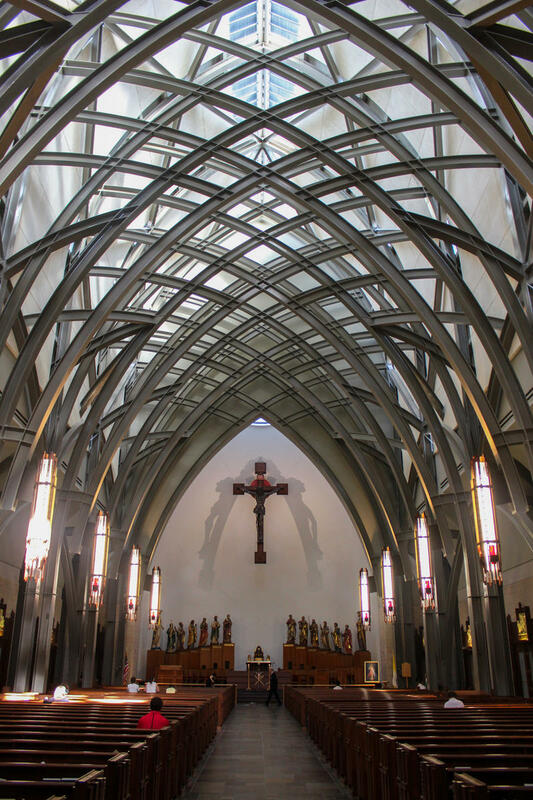 And, Diocese of Venice Bishop Frank Dewane did. On Tuesday, U.S. Sen. Bill Nelson and Florida Congresswoman Debbie Wasserman Schultz were denied entry into a federal detention facility in Homestead that is housing an estimated 1,000 minors who were separated from their parents at the U.S. border. Less than 24 hours later, President Trump signed an executive order ending his administration’s family separation policy, which — until that point — he had adamantly denied even existed. But, the end of the policy separating children from their families in the future doesn’t necessarily mean the reunification of those already separated families now.